We have curricula, lesson plans, activities, supporting materials, DVDs, videos, and games used by K-12, colleges, universities, DOLs, career centers, AHECs and many other organizations throughout the U.S. Our products are available for purchase online or you may complete the order form and send via email or fax (229.888.5154). 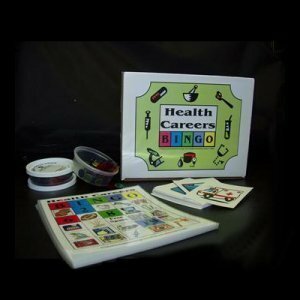 Health Careers BINGO is an interactive game geared towards elementary students. The game is designed to familiarize students with various healthcare professions and medical equipment. Each card contains a description of one or more healthcare professionals. Some cards also include a description of medical equipment or terminology. At the start of the game, all picture and number cards are shuffled together. The instructor then pulls one card at random. When a picture card is drawn, instructor reads the description provided on the back. Allowing up to 30 players, Health Careers BINGO is fun for a whole classroom.